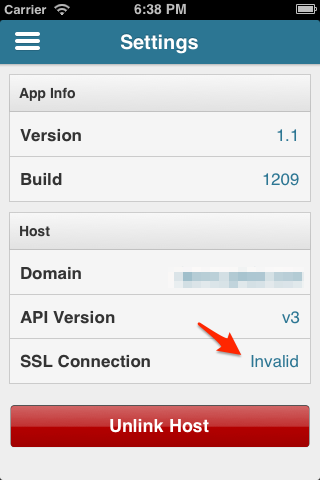 I am aware that some users reported few problems about be able to establish an SSL connection through the app and GitLab. GitLab Control is very strict about the safety of your data and in order to establish an SSL connection to your GitLab server you need to own a valid SSL certificate. One of the common problem you may face is that your certificate is self signed, so GitLab Control mark it as invalid not allowing you to establish an unsafe connection. Due to numerous requests, we have decided to be more flexible. Since version 1.1 you will be notified when attempting to connect through SSL using a self signed certificate and you will be able to proceed at your own risk. This has already been implemented, but I can not pull the current version 1.0.1 because it contains a very important bug fix, which needs to be available to all of you as soon as possible. So, this new feature will be available (for everyone) probably during the next week. 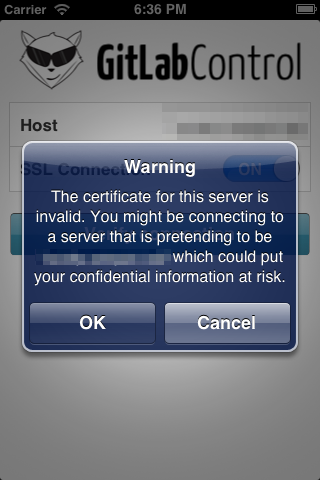 Please note that this is an exception valid only for untrusted certificates (for example a self signed one). There may be a bunch of others errors that can cause your certificate to be invalid, but you should be able to fix them without the need to pay for a certificate signed by a proper CA. It has been a very long way through the development of this app. There have been very awesome moments full of enthusiasm and others when I really wanted to give up. No matter what, despite all the difficulties, GitLab Control is now the first real iOS App that brings your GitLab projects with you wherever you go. Liwei Xia: for cooking and taking care of me during my sleepless coding night. Dale Buckley: friend and colleague for putting up with me. Fabio Ricali: author of the cool GitLab Control logo. Armando Alberti: for helping me with the website. Jean Baptiste Praud: for localizing GitLab Control in French. Blake Watters: author of RestKit. All the people who joined the beta test: for their valuable feedbacks and suggestions. New Initial release of GitLab Control. Hi everyone and welcome to the GitLab Control blog. Keep your eyes peeled here for updates on what we’re working on, our latest features, and other goodies!